the conceptual plans for updating the west side of the tom bradley international terminal, and construction of a new midfield concourse at los angeles international airport, will be designed by fentress architects. 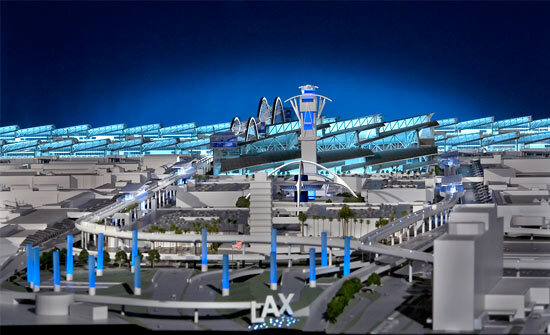 the plans to modernize the LAX, the fifth busiest airport in the world, includes a two-level bridge which will offer train rides on the lower level, or automated pedestrian walks on the upper level. the split-level design will provide lounges at either end of the bridge, welcoming visitors with north and south facing views of the city. the construction will include flat-seam, stainless steel stretched over column-free structures, glass curtain walls and centralized security. inspired by the pacific ocean, the rooftops are meant to appear like rhythmic waves breaking on the shore. the wave-like roof is also meant to reduce glare from the building’s south-west side, while trying to utilize as much natural light as possible.